Want to represent your alma mater or just show off your loyalty to your favorite school? Our line of College NCAA party supplies is perfect for doing either one. Use our great line of NCAA & college team products on game day or use them for events celebrating your favorite college. 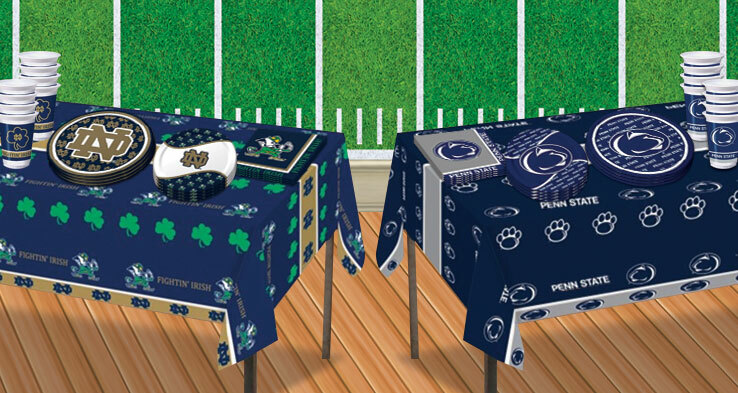 For example our Notre Dame plates, Florida State napkins, Ohio State plastic cups, or a Texas A&M table cover. PartyCheap can make it easy for you to decorate for your event while adding the touch of your favorite college teams to the mix. We offer a variety of products from colleges all across the country from Penn State down to Alabama and across the country to USC, just to name a few. More college teams and products are always being added to our website so check back often to see what new products we have to offer. Whether it’s for your tailgate on game day, or an event for your school we have you covered with all your NCAA College team party supplies here at PartyCheap.com! Anytime of the year is a great time to have NCAA parties. The NCAA has some of the most fun sporting events to watch and no one likes sitting at home and watching them alone. Have a group of friends over on Saturdays and watch the football games on Saturdays. It’s a great time to spend with friends and family and make a lot of great memories. You could also hold an event to watch the College Football Playoff, or watch your team as they play in their bowl game. Invite all your friends and family over to cheer on your team in their final game of the season. We also have over a great selection of generic football products that can help make your party even better. Another idea for celebrating a NCAA is to have a March Madness viewing party, order products from you and your friend’s favorite teams playing in the tournament. Our disposable plates, cups and napkins make clean up a breeze. The possibilities are endless for your parties. No matter what sport you’re getting ready to watch your team play in we got you covered with all the NCAA party supplies you need for your party right here at PartyCheap!